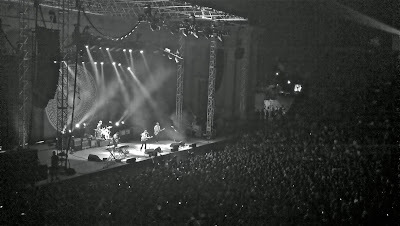 Vampire Weekend, the greatest ever Californian band who are not from California, swept through Berkeley on Saturday night during what felt like a sort of victory lap of their giant Contra tour, and they brought along The Very Best and Beach House for the ride. When the band first came through California back in April, they didn't seem as loose and jubilant as they did in Berkeley on Saturday night. When the Brooklynites played Oakland's Fox Theater on April 20th, Contra was still settling into people's minds. This time around, Contra has become a clear hit and widely regarded as one of 2010's best releases. They encouraged more crowd participation and even treated the crowd to their cover of Bruce Springsteen's "I'm Going Down". More changes: gone was the giant backdrop of Contra's infamously embattled cover art, replaced with a mysterious circular design filled "White Sky" lyrics that looks like it could have been some sort of easter egg from Lost. 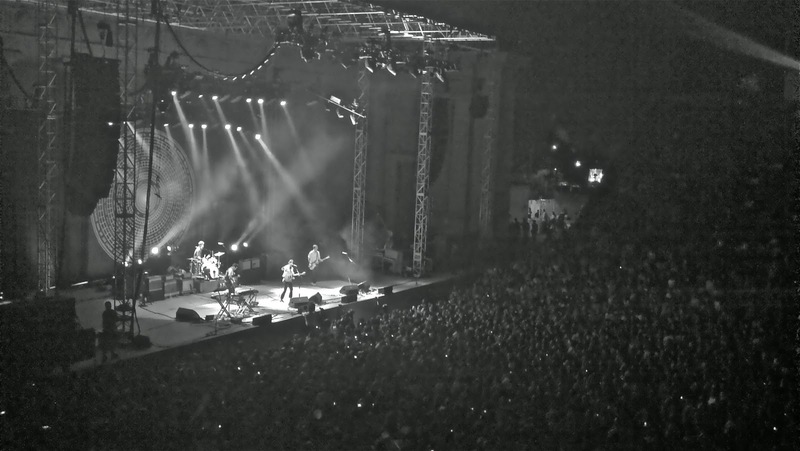 As both Vampire Weekend albums are filler-free, so are their concerts. The band didn't play one disappointing song, though slower jams like "Taxi Cab" and "I Think Ur a Contra" were sometimes hindered by the annoying conversations by equally annoying Berkeley kids sitting nearby. 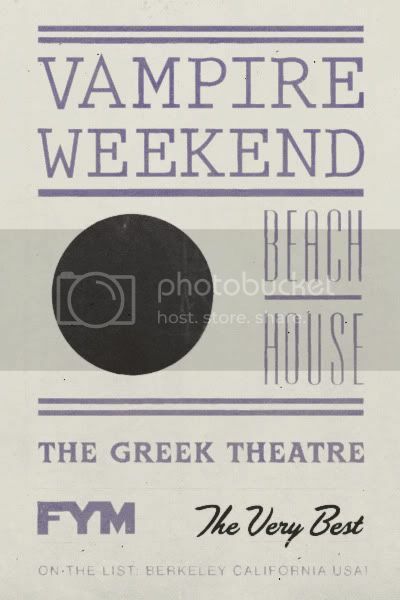 The setlist didn't change much from April's shows, but you can never heard some of the crowd pleasers enough, it seems, as songs like "A-Punk", "Cousins", and "Giving Up the Gun" got the pit moving and the people sitting up on the Greek's stones swaying. Back in 2008 when Vampire Weekend brought along YACHT to tour with them, jokes were made about how this band made up of rich kids from Columbia University were touring with a band whose name was shared with something their parents likely owned. Well, on this tour it's the same story again but with Beach House. The Baltimore dream pop duo, flanked by a full live band, performed cuts off their previous two albums, this year's Teen Dream and 2008's Devotion. Blissed-out highlights included the gorgeous Teen Dream pieces "Walk in the Park" and "Take Care", which, along with the remainder of their set, were visually underscored by a vibrant light show. The crowd was very into Beach House, which was more than I was expecting due to the contrast between Beach House's dreamy, hazy sound compared to Vampire Weekend's firecracker energy. And speaking of firecrackers and energy, the first artist of the night was The Very Best, straight from Lilongwe, Malawi in central-east Africa. Very Best singer Esau Mwamwaya fired up the crowd with the energy of a full band, which is remarkable as he was backed by one mere DJ playing mostly backing tracks. Mwamwaya's infectious energy radiated not only from the beginning of his set to the closer "Warm Heart of Africa" (a longtime favorite here at FYM featuring Vampire Weekend's Ezra Koenig) but throughout the evening. 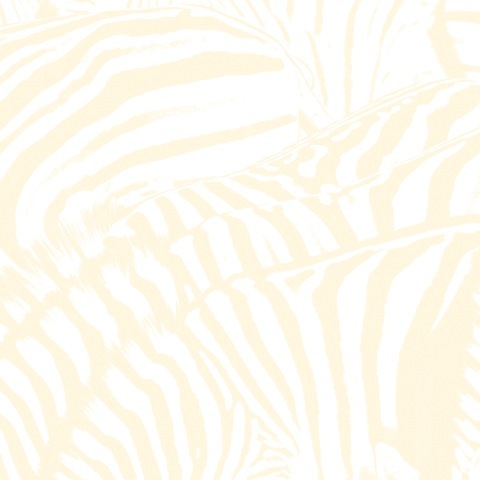 The Very Best's unique mix of electro-pop and African pop and rhythms was an obvious great compliment of Vampire Weekend's now well-known "Upper West Side Soweto". 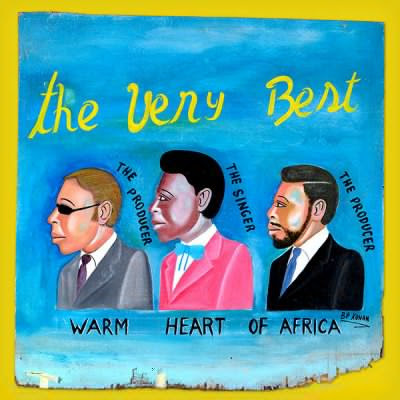 The Very Best's 2009 album Warm Heart of Africa is a solid multicultural musical representation of what I imagine can be a fun night out in Malawi, London, or anywhere else the group touched base in to make the album. Featuring the aforementioned clash of electronics, pop, and organic percussion, Warm heart of Africa was one of the most unique releases of last year that really felt like the start of a new movement.